1 double bed, sleeping 2 people. These 6 comfy rooms, each sleeping two, face Avenida Almirante Reis and have the choice of twin or double beds with an en-suite bathroom. 1 double bed, sleeping 2 people. Facing the Intendente square these 9 king-size rooms are quiet and can also be booked as a twin room. 1 king-size bed, sleeping 2 people or twins. Choose between facing Avenida Almirante Reis or Intendente square. An extra bed can be added for a child up to 12 years old. Additional cotbed available on request. 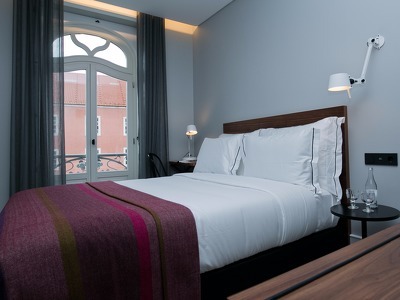 Hidden away in the Intendente neighbourhood of Lisbon, 1908 Lisboa Hotel delivers on every level. Hotel, restaurant, bar and hip hideaway, this award-winning building is surrounded by trendy cafés, bars, restaurants and shops. Not content with just offering you a hot shower and comfy bed to sleep in, the team at this boutique hotel want to help you experience the real Lisbon as the locals do. This city bolthole is also a constantly changing art gallery featuring some of Portugal's finest contemporary artists. Children welcome. Immerse yourself in Lisbon's most up and coming neighbourhood, Intendente. 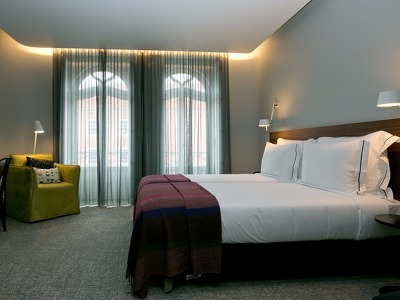 1908 Lisboa Hotel is within walking distance of some of the trendiest restaurants and cafés in town where you will find more locals than tourists. The restaurant, Infame, serves fabulous food with a smile and a sense of humour. This is one of the places to be seen in Lisbon. Pasteis de Nata (deliciously sweet custard tarts) have a cult following in Lisbon and should not be missed during your stay. For the best in town head to Antiga Confeitaria de Belem (R. Belém 84-92), just off the waterfront - we bet you won't be able to settle for just the one! The nearest train (underground) station is Intendente, a 200m walk. The nearest airport is Lisbon Humberto Delgado International Airport, a twenty minute drive (Approximately 6.8km distance) or a half hour ride on public transport. 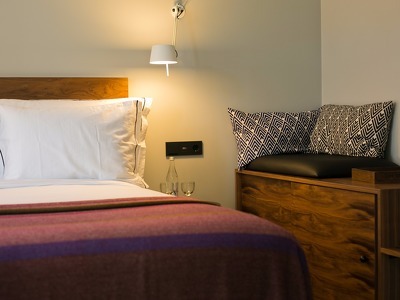 If a cancellation is made within 3 days of arrival, 100% of the first night will be charged. This has been one of the best experiences that I've had in a hotel. The staff was extremely nice and helpful, especially the front desk personal. Overall the hotel was kept clean, well preserved, and organized. The rooms were exceptionally maintained, with beautiful decor, and ideal amenities. The location was wonderful with restaurants surrounding the area and shopping centers withing walking distances. I'll definitely stay here again if I were to return to Lisbon. Went for drinks and lunch. The bar staff were friendly and spoke great English so made the whole thing very painless. One thing that I noticed was that they were not very hot on whether or not the menu was actually correct. There was some confusion when I ordered a drink if they were still offering that particular cocktail. However it was swiftly sorted and was the only negative I could think of. Amazing hotel! My wife and I stayed here for 2 nights (nights 5-6 of an 8-day trip around Portugal) and couldn't have had a much better experience. Hotel was spotless and beautiful. Staff was extremely friendly, genuine, and always willing to help. Need directions? Need suggestions on where to go/eat? Need help planning an entire day's worth of activities (in less than 10 minutes)? They will have you covered, and were truly happy to help us until we had what we needed! Highly recommend.